Ph.D. in Radiology is a 3-year doctoral programme concerning the field of Radiology and Radiological Science. The eligibility for the program is qualifying MD or DM in Radiology or related field with a minimum aggregate of 55% and above from a recognized university. Candidates for the program are selected on the basis of Merit. In addition, they are supposed to take up the various state and national level examination conducted by respective universities and colleges, followed by sessions of counseling/ personal interview and group discussions. The course is considered highly lucrative as it aids in adding further value and weight for those who have completed their DM or MD in Radiology. Ph.D. in Radiology course deals with the area surrounding radiography and its science. Students are given a broader outlook of the subject for which it is necessary for them to have a general understanding of the subject and its skills. In addition to this, they should have the basic skills of research, good interpersonal skills such as written and verbal communication ability. Having good analytical skill for reading samples along with hands-on training and lab work to make them proficient in the subject. Having a general idea of handling computer is considered an added advantage for the program. The course fee for Ph.D. in Radiology ranges in average between INR 15,000 to 2. lacs for a span of 3 years in India. The course opens up wide prospects in fields revolving round areas of Radiology wherein the students are hired as specialist doctors and surgeons in Clinics, healthcare, government clinics, private hospitals and much more. The average income earned by the doctorates after the successful completion of the program ranges from INR 2 to 19 per annum. Top Recruiting Companies Defence, Hospitals, Clinics, Dental Clinics, etc. Job Positions Radiation Therapist, Pediatric Radiation Therapist, Researchers, Professors, etc. Ph.D. in Radiology: What is it About? 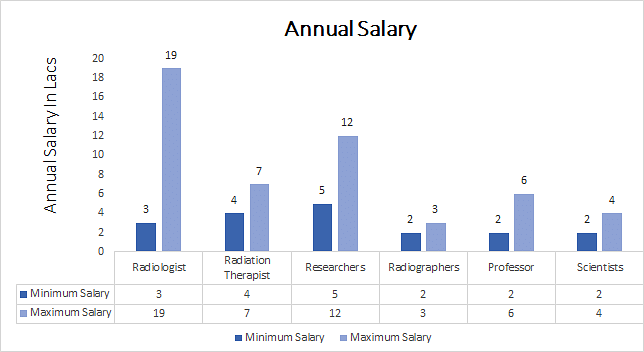 Radiology is primarily related to the field dealing with the study of radiation, ultrasound, and other imaging techniques used in the field of Healthcare. Ph.D. in Radiology course offers candidates an advanced knowledge of using equipment and its application in varied fields. Students through the course are rendered a comprehensive outlook in the subject thereby making it a career oriented course. The program covers through several specialized areas of radiology and radiation which is applied in the diagnosis of disorders related to human body. Ph.D. in Radiology course instills in students the aspects of reading data, working in the laboratory, the tools, and techniques for handling the equipment. Students are imbibed with the general understanding of the subject by making polishing their competence in subjects like Mathematics, Physics, Science, and Technology. The program revolves around the areas of radiological sciences. Ph.D. in Radiology curriculum is designed in a manner of rendering students an intricate understanding of the area through the topics involving fundamentals of radiology, its ethics, radiation measurements and the safety measures. The other methodology includes laboratory practice, presentation, project work, internship, thesis generation with the help experts and professors of the field. The course also offers students a platform to interact with experts from the industry, ask them questions, discuss case studies, clear doubts through seminars. Ph.D. in Radiology course trains candidates in gaining further expertise in the areas of radiology and its science. Candidates after the successful completion of the program are hired in areas of clinics, healthcare, NGOs, government and private sector hospitals. The overall aim of the program is instilling in students with the required skills and competence to emerge as professionals of the field thereby gaining proficiency in the field. Applicants are supposed to qualify their MD or DM in Radiology with a minimum aggregate of 55% and above from a recognized university. They are required to pass the entrance examination held for the program. Some of the reputed colleges and universities may conduct the sessions of PI/GD for selection of candidates. Aspirants seeking admission to the program of Ph.D. in Radiology are supposed to fulfil the set criteria as prescribed by different universities and colleges. The minimum eligibility requirement is passing DM or MD in Cardiology with 55% aggregate and above from a recognized university. They are also supposed to pass the entrance examination held for the course. This would be followed by the sessions of Personal Interview and Group Discussions in order to gain a detailed overview of the applicant’s credibility. The eligibility criteria are subject to differ for different colleges. However, admissions will be done solely on the basis of Merit. The cumulative marks obtained in qualifying exams, entrance test, PI, and GD will be calculated to count the merit cut-off for different universities. Applicants can apply for Ph.D. in Radiology course either offline or by visiting the official website of the respective colleges. All the important information pertaining to the date for admission, entrance test and other such will be notified through email or listed on the official website. Ph.D. in Radiology program enables candidates to gain proficiency in the varied specialization area of the field related to radiology. The course offers students a platform to gain the advanced knowledge through the application of projects and research to prepare individuals in pursuing their career in the scientific and educational field. Candidates after the successful completion of the program of Ph.D. in Radiology are trained well to go about exploring their knowledge in their chosen career stream. This opens a myriad of opportunities for students to gain a deeper perspective about radiology and use their skills in areas of radiology, image processing, defense, healthcare, mental health, hospitals, clinics, dental clinics, asylums and much more. They can choose to become radiologists, researchers, scientists, magnetic resource imaging processor, radiation therapist, pediatric radiation therapist, professor and much more.